While sewers of a certain generation often learned to sew by hand, lots of younger stitchers started by cranking up a sewing machine. But not Vanessa Christenson. When she was in middle school she asked a friend of her mom’s to teach her to quilt and because she didn’t have a machine, hand sewing was the method she learned. She created a few blocks, but then high school and college intervened. “I was dating and involved in activities and having so much fun that sewing didn’t come into my mind again for years,” she says. When it finally reappeared, Vanessa was married, 25 years old, and pregnant with her second son. “I wanted some cool pillows for my home,” says Vanessa, for whom interior design is a lifelong passion; even when she was just four and five years old, she loved moving things around her bedroom. 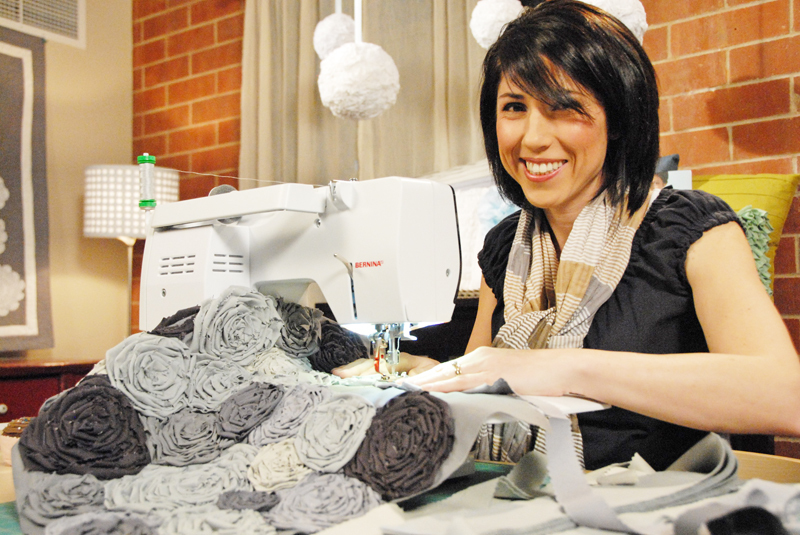 A friend taught Vanessa the basics—how to turn on and thread a machine—and Vanessa hasn’t looked back since. Today, sewing is a defining characteristic of her life. She’s written a sewing book, Make It Sew Modern; creates patterns for quilts, bags, pillows, and more; and has designed her first line of fabric, Simply Color, for Moda. Though thoroughly modern, Simply Color was inspired by the past. Vanessa’s an avid thrifter and loves fabrics from the 1950s, ’60s, and ’70s. “I’ve always been drawn to flowers and ‘spriggy’ things,” she says. One of Simply Color’s leaf motifs pays homage to a vintage sheet she found at Goodwill and used to make herself a skirt and a quilt for her daughter. 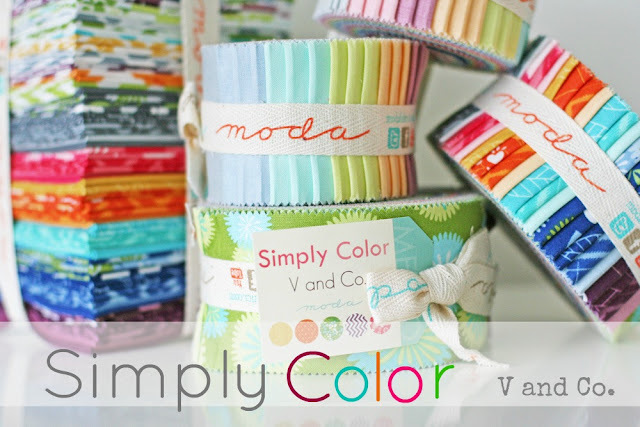 Simply Color is also inspired by Vanessa’s past. Though she now lives in the Midwest and spent some years in Utah, Vanessa’s roots are in California and she says the blues and greens of the ocean are a constant in her life. She’s excited by the way hues like eggplant and tangerine work so well with her lifelong favorites. For more about Vanessa, visit her blog V & Co. I am so excited for Vanessa’s first line. It is just fabulous!!! Eu sou e estou completamente apaixonada por esta linha de tecidos,um amor.PARABÉNS!! !SUCESSO !!!. Congratulations Vanessa on your line with Moda. As you know they are fabulous to work with! See you at Market. 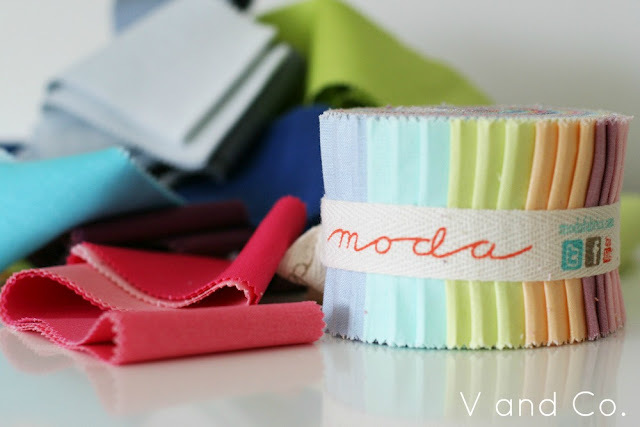 Moda and V & Co together! Two of my faves!! Congratulations Vanessa! Can’t wait to get my hands on some!! 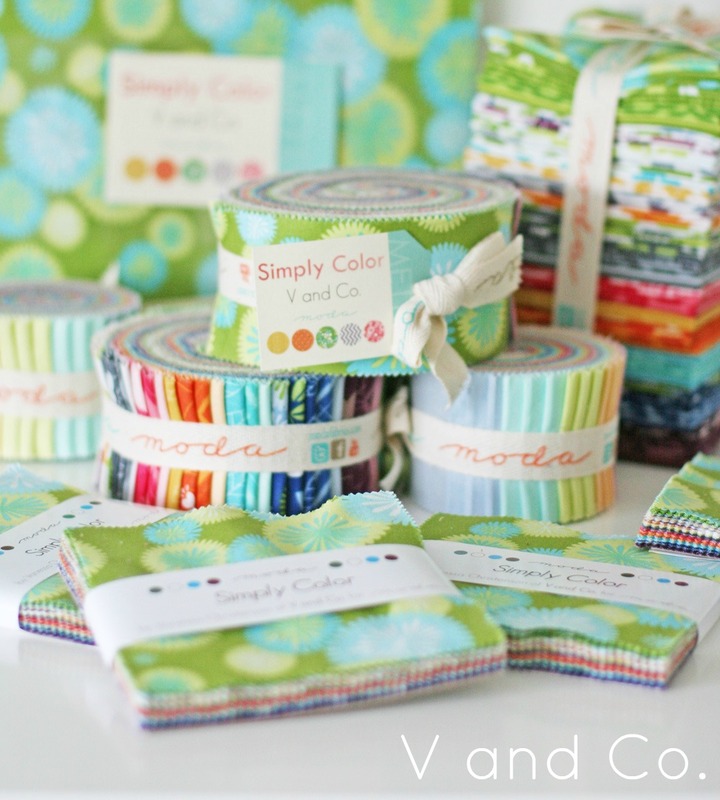 Congratulations,Vanessa.Your line fabrics is fantastic! I love your colors, your patterns, your style. Always look forward to your blog posts. It is an exciting time for quilters and sewers alike. Thanks, V! Please could you tell me which colour is the white? I know that sounds silly, is it a bella solids fabric? Cream or white? Thanks. Love the fabric collection!